Truth Bee Told was created by a group of women with the intent of building a space for reviews, news, and intersectional views on movies and television series. I Can't Get No Satisfaction: Are Series Finales Ever Satisfying? Well, we are officially only 100 days out from The 100 Season 6 (premiering on the CW, April 30 at 9/8c) so I thought now would be the perfect time to discuss a few things I’m excited for as we head into the last lap of hiatus. Although Jason Rothenberg (showrunner of The 100) has been very closed-lipped about spoilers this season, releasing almost no behind the scenes information this year, Season 5 still left me with a few questions I’d love to see answered in Season 6. 1. What will become of Marcus Kane? Kane was in a pretty precarious position (trying saying that five times fast) the last time we saw him and a cryogenic chamber is currently the only thing keeping him alive. Arriving on a (still unnamed) new planet might provide Abby with the tools she needs to save her man, sure, but will Henry Ian Cusick’s new role as Jonas Lear (a main character) on Fox’s The Passage prove to be one hurdle that Kane can’t overcome? 2. Will Charmaine Diyoza finally have her baby? Pregnancy can be a wonderful time in a woman’s life, but I can’t imagine that any woman wants to be pregnant for 225 years — and no, that is not a typo. Following two separate 100-year cryonaps, Diyoza now holds the Guinness World Record for longest pregnancy ever. Now that the Eligius III crew and the remaining 100/Grounder group have managed to find some semblance of peace with each other and have managed to find an entirely new world, will baby Hope finally get her chance to live outside of utero or is she doomed to be the forever fetus? 3. What can we expect of the “New World”? Given the information Monty found about this planet, we know that it is assumed to be capable of supporting human life. This means it must be somewhat similar to Earth. Outside of that we’ve been given no new information, even the name of the new planet (if it has one) has been deemed a spoiler. I believe this might be one of the things I find myself most interested in this season. What will this new world look like? Will there be new flora and fauna? Will there be actual homes? Will there be showers and better lighting (with two suns one can only hope!)? What about the people who have been living on this new world for 200 years now? Who are they and what can we expect from them? Was there an already existing species on the planet? I have so many queries about this portion of Season 6 and I hope they find a way to successfully answer them all! 4. What will happen to the Flame (and Madi)? Although the Flame has thus far only been used as a tool to determine the next commander, we know that its original purpose (as created by Becca) was to process probabilities, helping its host to choose the best path of success (a feature that we see Madi use in the later episodes of Season 5). We can assume there are other helpful features that might make an appearance given time. However, what does this mean for Madi now? Should there be a commander on a new world? Wouldn’t continuing to utilize an old system of leadership make the group now aboard Eligius III susceptible to once again succumbing to old problems? Will Madi be given an opportunity to just be a child or will the mantle of leadership remain draped across her shoulders? 5. Who is Jordan Jasper Green? The child of Monty Green and Harper McIntyre, Jordan was one of two big reveals in the Season 5 finale. The audience has no idea who Jordan is, and I can’t help but wonder if Jordan himself knows. He’s only known two people and the sterile environment of the Eligius III ship his entire life. What do the introduction of new people (and therefore new influences) mean for him? What secret skills does he have? How will he fit into the family unit that already exists? Last season was a rough one for the show’s former butterfly-babe-turned-sociopath. She went to great extents to make sure that she maintained her power and ultimately that path took her down a very dark road that wound up with her losing everything and everyone, including her big brother Bellamy Blake. Will she be able to recover from her choices or will the show continue to have her delve deeper into the darkness? 7. Where does Clarke fit in now? After her (admittedly not awesome) decision making at the end of Season 5, Clarke has successfully managed to alienate a lot of her friends in her desperation to keep Madi safe. 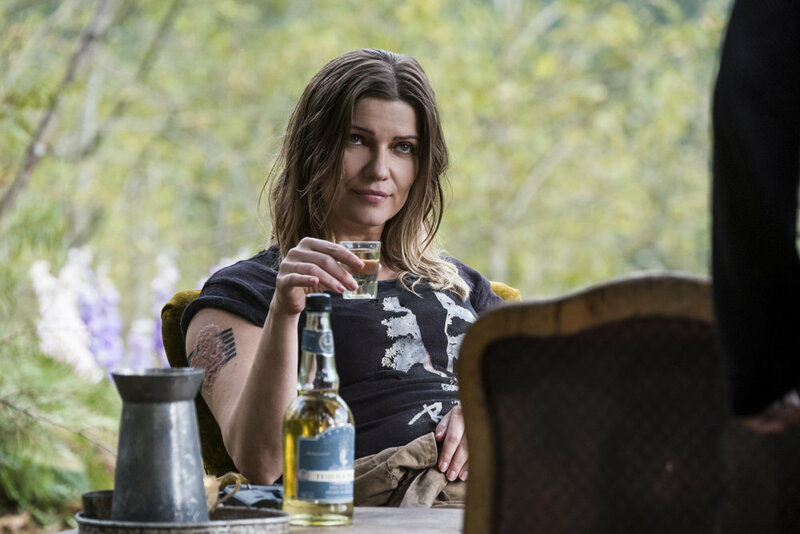 So far, Bellamy is the only person she’s had a conversation with in the fallout and although they seem to be on the path to mending their relationship (as they tend to do rather quickly), there’s no hint that the others are willing to forgive her as quickly. In addition, with Madi now recognized as the formal leader of the Grounders and others deferring to her judgement at the end of Season 5, what does that mean for Clarke as a leader? Perhaps this will be good for her; Clarke spent years leading others and maybe this will finally give her some much needed downtime, but I wouldn’t bet on it. 8. Love in the time of cryo? The “will they/won’t they” tension between Bellamy and Clarke has been building since the pilot episode, but now that Bellamy is in a relationship with Echo kom Azgeda, many audience members feel we’ve finally received the answer to that question. I’m not so easily swayed. Bellamy assured Echo nothing would change between them once they arrived on the ground at the beginning of Season 5 and it’s easy to believe that remains true, but the couple didn’t get to spend a lot of time together over the course of the season, and they both experienced things that have changed them since that initial conversation. Although nothing changed during their brief time on Earth, Echo’s quick reversion to “murder first, ask questions later” and Bellamy’s willingness to possibly murder his sister for Clarke (among other things) and the ending of Season 5 — with Clarke and Bellamy once again together, staring at their latest adventure — leads me to believe that we haven’t received the final answer on that question just yet. 9. What is going to happen to Miles Ezekial “Zeke” Shaw? Zeke (pry this name from my cold, dead hands) popped onto the screens and into our hearts almost instantly. A conflicted ex-soldier, with a heart of gold and a need for speed (I have my fingers crossed there are motorcycles somewhere on the new planet), Zeke was a scene stealer and successfully managed to infiltrate the heart of our resident genius mechanic Raven Reyes. Everything seems great with their budding romance but, just as Henry Ian Cusick is spending time on another show these days, Jordan Bolger, Zeke’s actor, is booked and busy with appearances on BBC’s The Long Song, a film (Scarborough) and the Oprah produced David Makes Man. With behind the scenes footage few and far between these days we’ve had no real evidence that Jordan has been filming The 100 recently and I find myself…worried for Zeke. One of my pet peeves last season was that, because everything was so fast moving, the characters didn’t have any opportunities to talk about their feelings and who they’ve become over the six-year separation. Will our characters finally be given the opportunity to talk and discover who they are now and what that means for their relationships or will the new world prove a distraction? These are a few of the most pressing questions I have for The 100 right now but this list is far from complete. If you have any burning questions you’d love to see answered please feel free to write them in the comments below!! Hope to see you all in just 100 short days when The 100 returns to the CW on April 30th, 2019! April Morris is a TV watcher, blog owner, black woman, and mom in the metro-Detroit area. She blogs about her favourite shows and movies and tries to make people aware of media's real-world affect. She's captivated by the way we use media to showcase our ever-evolving views and how we interact with the world, the future of our culture, and strong storytelling. She's also pretty good at using the internet. Why Am I So Obsessed with Rom-Coms? Truth Bee Told is all about voices being heard.